Has anyone in the great wide world of North Carolina Miscellany Land ever heard of Wonderland, North Carolina? I stumbled upon an image of it (see below) the other day while flipping through Views of Potter Farms Development : Showing Various Stages in the Evolution of Potter Farms, which is a wonderful pamphlet that we have in our vault collection. From the description below the image and other clues in the pamphlet, Wonderland seems to have been in the Beaufort County region along a line of the Norfolk Southern Railroad. Did the town disappear like the Cheshire-Cat? According to an elderly lady, Rachel Stokesberry, whom I interviewed near Wenona a few years ago, Wonderland was a logging camp owned by the Roper Logging Co. (which also, I believe, owned the Norfolk Southern). They were clearing the cypress out of the East Dismal Swamp (long gone now) and cutting it at either the company’s Roper or Belhaven mills. Once they cleared the swamp (and they cleared every inch of it), they began selling the land to farmers to grub out the stumps and begin to work it agriculturally. That was probably in the ’20s, maybe ’30s. One of the Dutch immigrant farmers at Terra Ceia (nearby) told me–this may just be a story–that the name “Wonderland” came from the phenomenon of peat fires that smoldered all summer, sometimes staying underground for weeks, then exploding to the surface, burning local houses, some livestock and, they said, at least 1 child. It was a wonder. Great blog–I just found it. David, thanks for the information. Your comment helps to make sense of all of the pamphlet’s photos (which show cleared forests, canals, and a few other images from the region). Jason, to me the pamphlet’s photos are a real find. To my knowledge, they are the first photographs of Wonderland that have turned up, and the entire saga of the Roper Lumber Co. (the state’s largest at end of 19th and beginning of 20th century) and its logging camps has been neglected and is largely forgotten. The photographs in your pamphlet are a real treasure and I can’t thank you enough for alerting us to them. The canals, by the way, were central to the company’s plans. Following timbering, a series of tremendous canals had to be built in order to drain the land for farming. Most, I believe, drain into the Pungo River. We have a small folder of materials on the Roper Lumber Company in our library, but I didn’t see Wonderland mentioned. We have also scanned a few photos that show Roper operations in 1914 when forestry students at the Biltmore Forest School visited (http://fhsnb.oit.duke.edu/dbtw-wpd/exec/dbtwpub.dll and search for Roper). “A Trip Through the Varied and Extensive Operations of the John L. Roper Lumber Co. in Eastern North Carolina and Virginia.” American Lumberman (April 27, 1907): 51-114. Reprint by Weyerhaeuser Company (New Bern, North Carolina, 1986?). David is right. Much more needs to be done! The NC Collection also has the following postcard from ca. 1911: Roper Lumber Co., Largest Saw Mill in North Carolina, New Bern, N.C. I was born in 1937 in the community ajoining Wonderland, that being Pike Road. By this time, the area called Wonderland, was still called Wonderland but, there was nothing left of the camps. The Railroad was gone, taken up, completely. There remains the name of Pike Road Station, but even the depot was gone at the time of my birth. My Daddy told of hauling corn to the “Pike Road Station” to be hauled by rail. We have this on tape when my brother interviewed him. The dutch community that came to Terra Ceia in the early to mid 30’s would not be able to give info on Wonderland. I was so excitied and pleased to learn that Wonderland had a postoffice in 1918-1925. We had a postoffice in Pike Road, Wenona, and Pungo. The first Pike Road Post office was located in my grandfather’s store, W.A. Respess being the post master. If you will take the time to visit my website, there is some Beaufort county infor mation of interest, although Wonderland is located in both Beaufort and Washington Counties. My mother and her family lived in Wonderland. Mother remembers being a a young child and said her family was the last family to leave Wonderland. I would like to get any information and picture if possible. This is so interesting…I’ve heard my Daddy talking about picking up “chunks” (I think they were roots left after the land was cleared) in Wonderland where we still have property. He’d know the names of the canals too…the only one I can recall is the “Intercepting” canal. My grandfather bought a tract of land in Wonderland in 1948 – it is still in the family and owned by my dad, Vernon Daw. What I beleive is the last house standing is on his property. I’ve heard him describe the line of worker house but this is the first photgraph I’ve ever seen of Wonderland as a logging area. I’m looking for information on the Winthrop, NC mill. I live on one of the creeks it was located on and frequently find the bricks, bottles and indian artifacts that tell me this was a large mill. Some of the older neighbors tell me about a large boardwalk and the boiler explosion at the mill. I would love to find out more information if you can point me in a direction. Hi, I have just stumbled on you guys! I am in the middle of a writing project that has involved me in research on the Roper family, and especially Lydia Roper, wife of Captain John L. I realize she has no involvement with his lumber empire, with its railroads and canals, but of course I’ve also gotten interested in all that. Does anybody happen to have run across anything about her? He, of course, is all over the internet. Lydia seems to be invisible. All this information here is fascinating. I wish I could use it. 1. What does “your comment is awaiting moderation” mean? 2. If I want to quote, in my writing, one of the people who has commented on this blog, how would I do that? While the Dutch may have settled in the 30s, the Dutchman who spoke of the name Wonderland being related to fires may have been relaying information on from what was understood. I’m sure they inquired why it was called Wonderland back then, too. I live in Terra Ceia, just south of what we call “Wonderland” – all farmland and canals. The area was known for the fires that burn the ground – b/c it was made mostly of peat. Such fires still burn in the area, more to the east in Hyde Co. Basically, the peat burns away and the trees fall over because there is no soil to hold them up. Just google “Evans Rd Wildfire” for images that show what I’m talking about. For those interested, there are maps available that have been digitized and orthorectified so they can be “laid over” top of Google Earth imagery. A google search will help you find them. Then, just download Google Earth (not just use Google Maps in your browser) and load them into Google Maps. 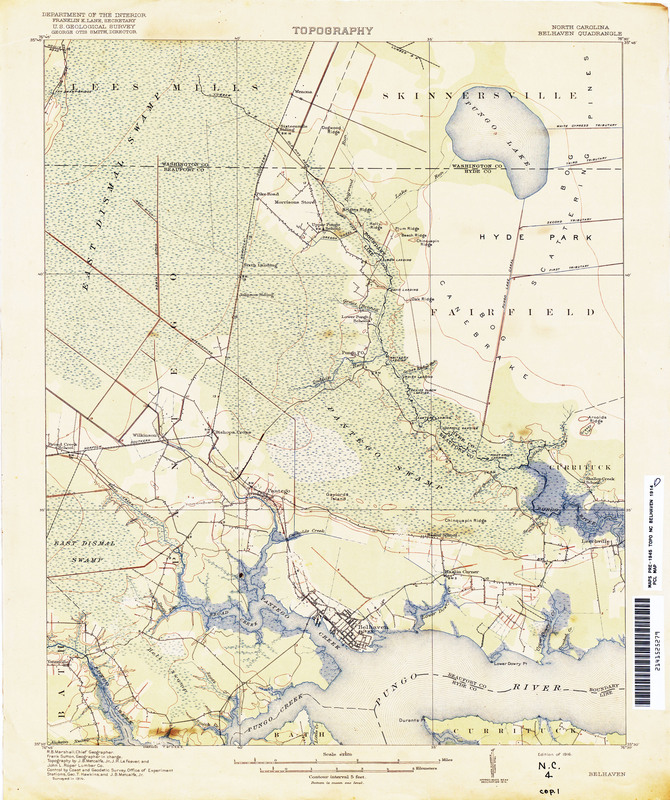 In the Terra Ceia area, you can find one topo map from 1914. The advantage of this is you can turn that map on or off, and view what’s there in present-day. Here is the url of a .jpg version of that old map.